Perhaps you use a certain browser simply because it came with your Mac, not because it provides you with the best Web-browsing experience. And your Web browser may not be doing all it can for you—in other words, it may not allow you to efficiently access all the Web has to offer. A Web browser is simply a vehicle that helps you get around the Web, and a good Web browser is one that’s unobtrusive. All the browsers in this review have common features—ways to manage bookmarks, cookies, and security options; tabbed browsing; and autofill capabilities for Web-based forms. Each browser also loads Web pages at about the same speed. The only noticeable speed difference used to be Firefox’s very long program-launch time, which seems to be resolved in version 1.0.6. Plug Me In, Soup Me Up Installing plug-ins in Firefox and Camino is as easy as downloading them from the Mozilla.org Web site. The plug-ins installed in Firefox are listed at the bottom of the browser window, on the right. While each of these programs implements standard features in a slightly different fashion, the principles tend to be the same across all five browsers, or at least similar enough that you’ll quickly get used to the differences. (Only OmniWeb posed a bit of a problem—the program’s default home-page setting was called Start Page and took us several minutes to locate.) These browsers differ most in the extra features they offer and in the ease with which they let you navigate the Web. 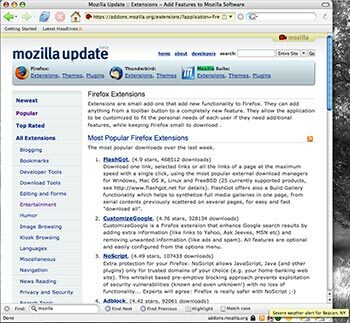 Mozilla’s Firefox and Camino are the most versatile and extensible browsers in this review. They are based on the Mozilla engine, which is compatible with most Web sites. And they are designed to accept third-party plug-ins, or extensions, which can add features, functionality, and different looks (or skins) to the program. But there are many more plug-ins available for Firefox than for Camino. 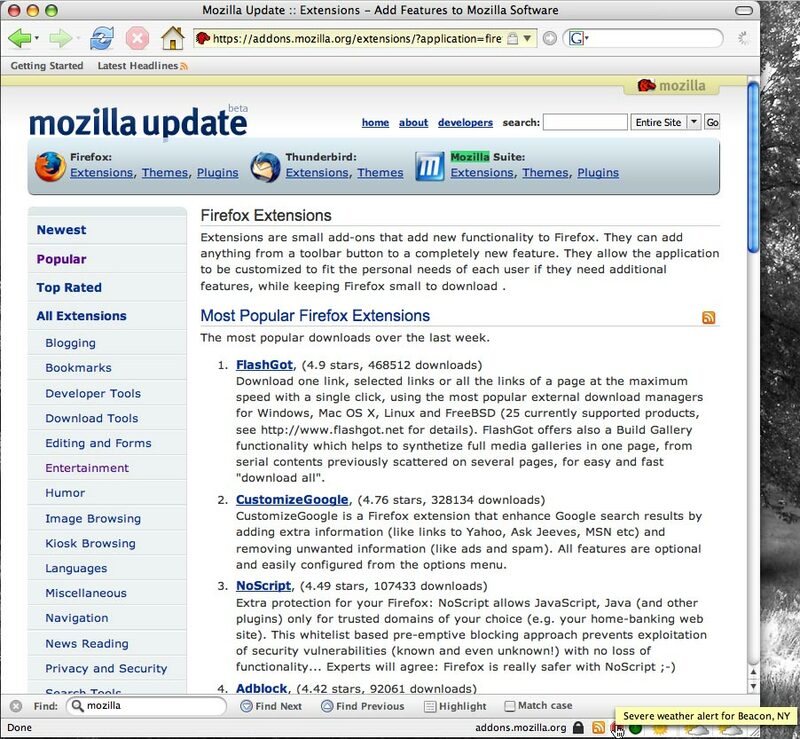 In fact, these extensions are what make Firefox so great. For example, Forecastfox displays a weather forecast at the bottom of your browser window. And my personal favorite, FoxyTunes, lets you control iTunes. There are so many extensions for Firefox that you can have nearly as much fun tricking out the program as you can browsing the Web. Firefox also includes several less obvious but equally cool tools. It has the best Find tool of the browsers in this review. While most browsers lay a Find window right on top of the Web page you’re trying to search, Firefox simply brings up a little Find box at the bottom of the page. Then it highlights the results on the Web page; options for how your results are displayed are easily accessible. This feature is nothing short of brilliant. And Firefox has a killer pop-up blocker that you can enhance with extensions such as Adblock, which also allows you to block other types of ads on Web sites. Unlike Safari, Firefox doesn’t have a built-in RSS reader; instead, it includes Live Bookmarks, which monitor Web pages that have RSS feeds and then alert you when the sites are updated. 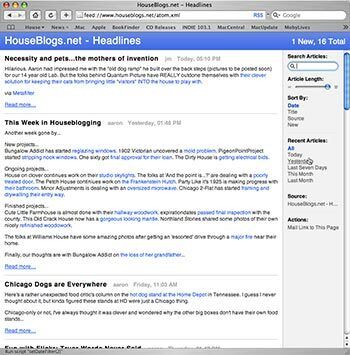 Newsworthy Safari now includes the ability to aggregate and display RSS news feeds. Aside from the fact that it’s built on Mozilla’s stellar foundation, Camino is a little immature. It lacks many features—such as text autofill (except for passwords) and RSS-feed recognition—that are standard in all the other browsers. You’ll want to choose a different browser for day-to-day use. Safari’s most touted new feature is its built-in RSS news reader and aggregator. 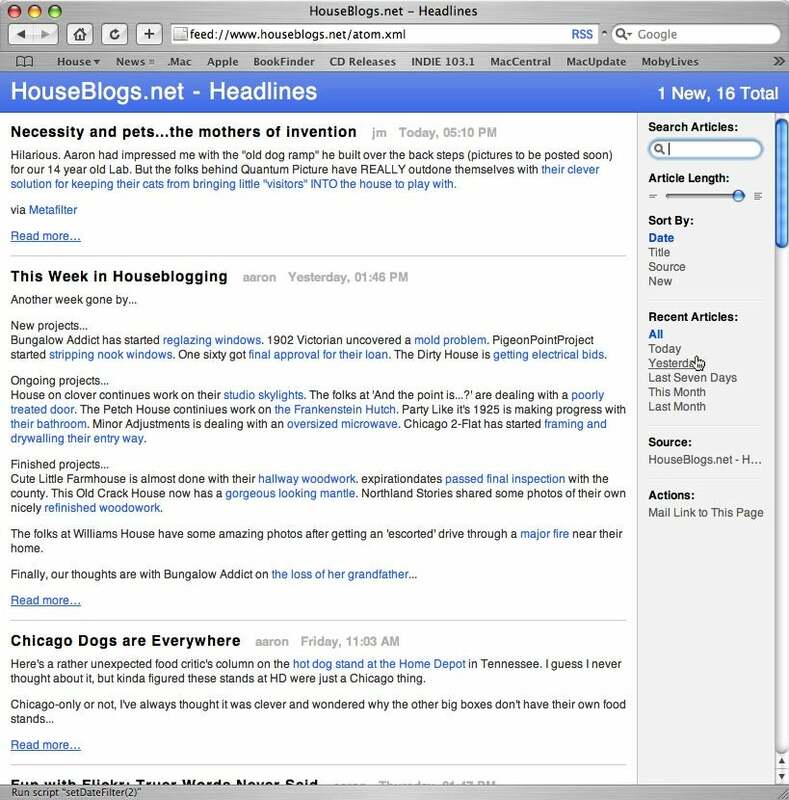 Many sites on the Web—such as Weblogs and news sites (including Apple.com and Macworld.com)—use RSS feeds to notify site visitors that the Web site has changed. You used to need specialized software to monitor and alert you to these changes (see our March 2005 review of RSS- and Atom-feed readers). But now most Web browsers include some RSS-feed-monitoring capabilities. Each browser, except Camino, monitors sites that have RSS feeds and alerts you when a site has been updated. Safari also lets you read all the latest headlines without having to leave the comfort of your browser. But Safari’s news reader is a little awkward. Short of creating a folder for all your favorite news sites, there’s no easy way to organize and view all your favorite feeds. So hard-core Weblog readers or news junkies who are used to using a dedicated program may not find Safari’s RSS feature useful. But if you’re new to the blog- and news-reading game, Safari is certainly a good place to start. Safari also has a leg up on the competition if you have a .Mac account. Using iSync with .Mac, you can synchronize your bookmarks across several Macs. Alexander Clauss iCab 2.9.8 free See full review . America Online Netscape 7.2 free See full review . Microsoft Internet Explorer X 5.2.3 free See full review .